Home EDEN targetinvest (TARGET INVEST-EXCLUSIVE) Is EDEN (7471) 450 acre land worth RM 165 million, 430 million or 800 million? Come and look and see for your own!!! (TARGET INVEST-EXCLUSIVE) Is EDEN (7471) 450 acre land worth RM 165 million, 430 million or 800 million? Come and look and see for your own!!! Today need to continue to talk deeper about Eden Inc Berhad. Since we know that Eden only biggest trophy is about the strategic big piece of land near Kuantan Port, which is very crucial and good for port storage usage, and also very critical for ECRL, that is the main point about it all. Today, I will only talk about the land, the 450 acre of land at Gebeng Industrial Land that Eden is holding on. 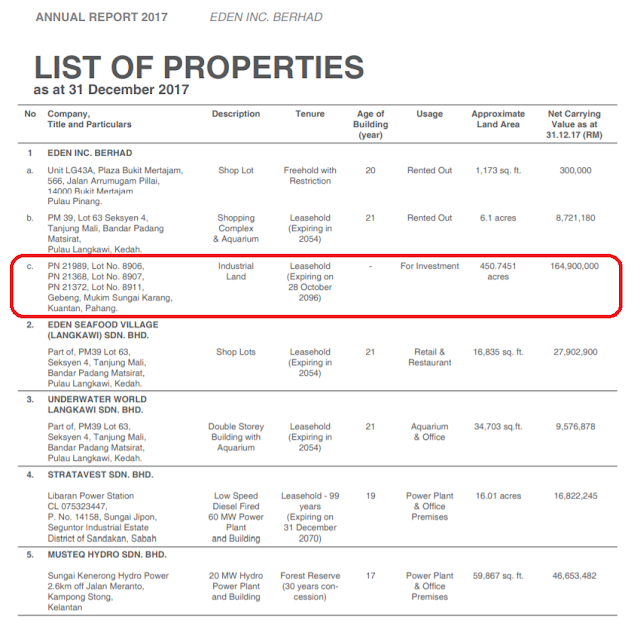 Yes, this is a big plot of land acquire some time ago, and the main question here is - Is the land value at RM 165 million reflecting the market value as of today condition ? Taking into consideration the place will get better with port development (Kuantan Port to be more busy + ECRL development), this place will be in more demand in the future. So, let us do some research on the public. RM 18 million for 10 acre, but this is just the asking price. Of course, owner have the right to ask any price they want. Wow!!! Very huge amount there compared to the annual report of RM 165 million. Big difference of RM 654 million. But again, RM 18 million is the asking price. Now, we need to go to some transacted price to determine the clearer price that is in demand. So, we will go to brickz.my to see the transacted price that is recorded in the land office. According to Brickz.my , the price of the land is around RM 22 per square feet. This is much reasonable price and also transacted price that reflect the demand can reach RM 22 per square feet. So now we put into calculation at RM 22 psf, what is the 450.74 acre worth. Now, looking back at annual report, the land is RM 165 million, which based on market value is RM 432 million. This is a difference of RM 267 million. Eden share price will be worth RM 1.10 if all land sold. If 50% sold also will get RM 0.55, and still got 50% to use. So is Eden attractive now? That you will have to do your own homework. Not a buy sell call here.